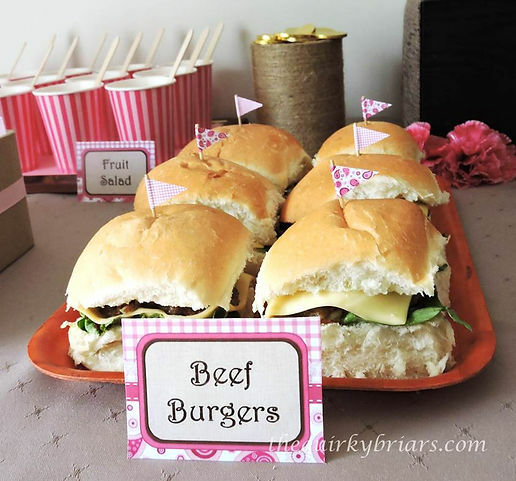 It’s that time of the year again – yup, hubby’s birthday. You know him – he just lets me do whatever for the celebration, as long as he’s allowed to cook his favourite dishes. This year, I was a bit torn. 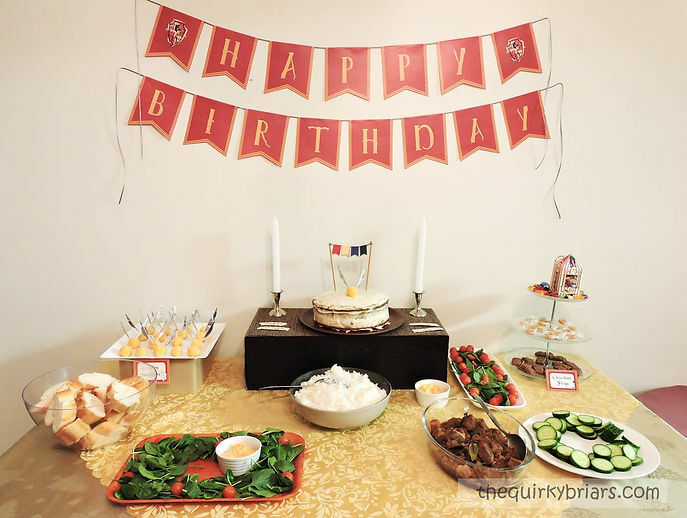 How can you top a Middle Earth themed party? Hold a minions themed party because he seemed to have been enjoying the Despicable Me films recently shown on the telly? Yeah, that’s a funny idea, but he just might kill me. Hahaha. We’ve also been enjoying the Harry Potter films lately. Yeah, I know, those films have been out for, like, forever. But just a while ago, one TV station was showing one HP film each week. Of course, we’ve seen them before, but it was nice to view them again and review the forgotten parts. 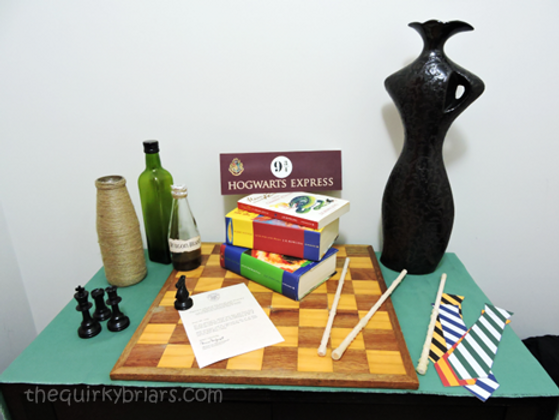 Besides, when you go browsing the net for HP themed parties and see all the details that others have prepared for their parties, how can you not hold one? 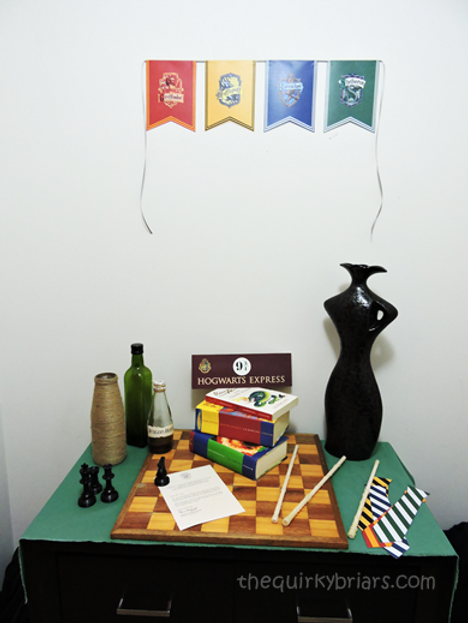 This is what greeted the guests at the entrance – Hogwarts houses banners, and HP related stuff on the table, including a few HP books, some wands, photo booth props (neckties in HP house colours), chess pieces, some potion bottles, a chess board, Hogwarts Express signage, and a letter from the Hogwarts School of Witchcraft and Wizardry. 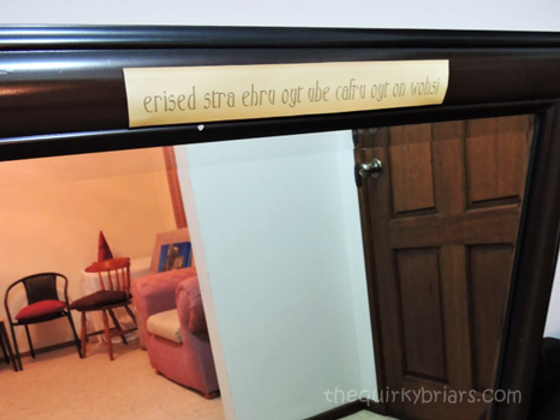 On the side wall, we had a huge rectangular mirror that’s normally stays there, so I decided to pretend it was the Mirror of Erised and labelled it accordingly. 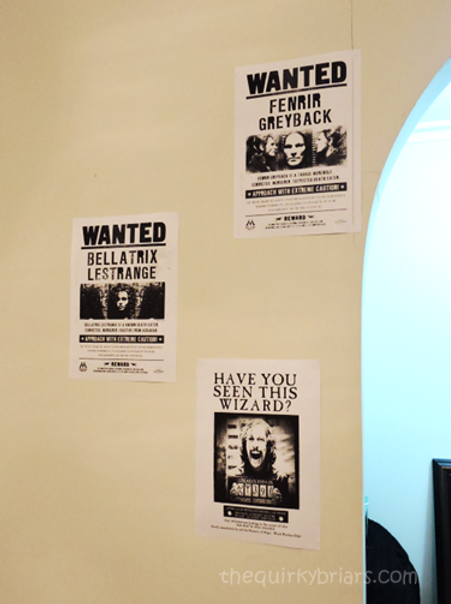 As you step into the lounge area, you’ll see that I had stuck some ‘wanted’ posters on the wall…. 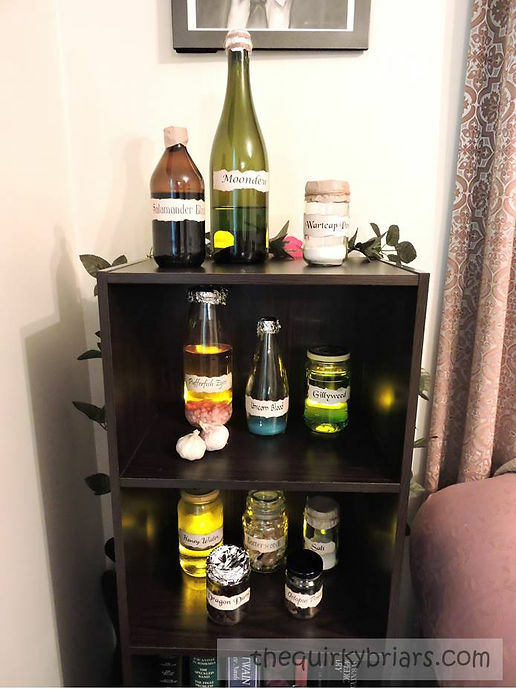 …while on the other side, I had shelves of various potion ingredients. I placed some battery-operated tea lights behind some of the glass bottles to show off the coloured liquids inside the bottles. Otherwise, it would have been too dark in the lower shelves for people to notice somebody fun in there. Hubby had recently finished this painting of a rather gloomy looking lake with the universe reflected on its waters. I incorporated it into the theme by telling people it’s the lake at Hogwarts, the one with the scary mermaids, where they held one of the events in the TriWizard tournament in the Goblet of Fire. 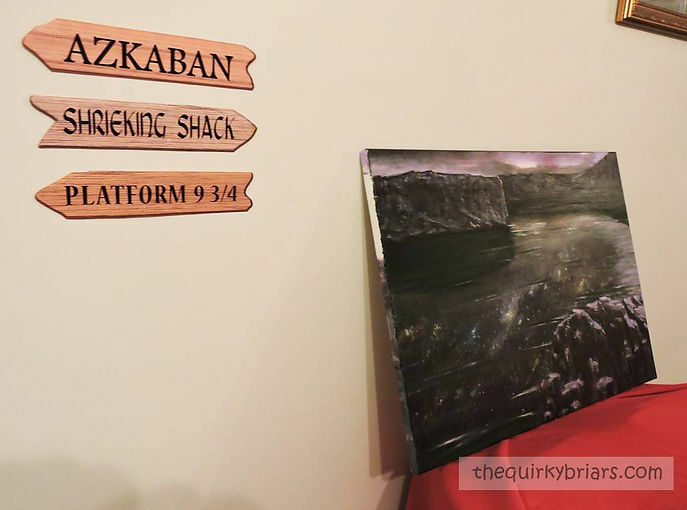 Just beside the painting, I also had some fake “wooden” arrow signs bearing names of some of the places in the HP world. The “Ministry of Magic” arrow sign was somewhere else in the house, pointing the direction to the ‘portal’ of the “Ministry of Magic”, in case some of the guests needed to go there for you know what. Here’s an early shot of the buffet table. Don’t ask me for a later shot of it when hubby started crowding it with all the foods, because I don’t have a presentable one. 😀 Hubby prepared most of the foods, which made him tired but really happy and proud of his accomplishment. I prepared the sweets, bread and the salads. I made him a very simple birthday cake. I didn’t want to make him Hagrid’s cake, simply because Hagrid’s style just isn’t my style. 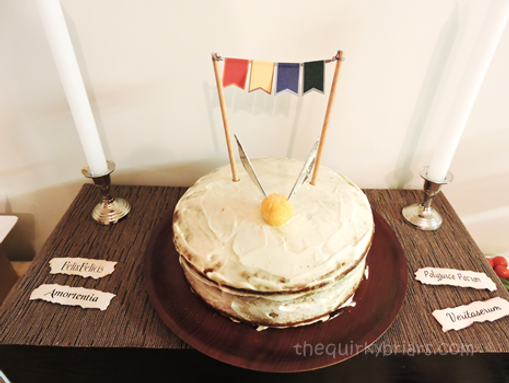 Instead, I just created a little bunting featuring the Hogwarts house colours and added a golden snitch in the middle of the cake. Simple, but super-yum…and I kid you not. 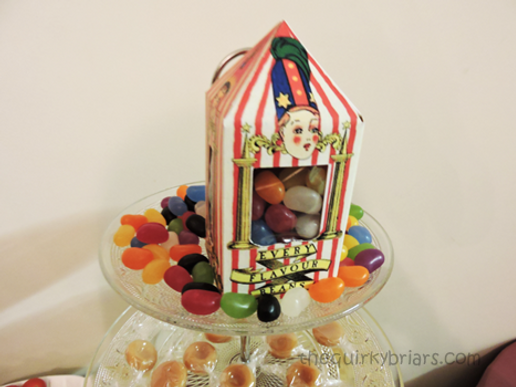 Of course you know that no HP themed party is complete without Bertie Botts’ Every Flavour Beans. They’re just the ordinary jelly beans I found at Coles, but that little striped box I painstakingly cut and assembled just nailed the illusion. 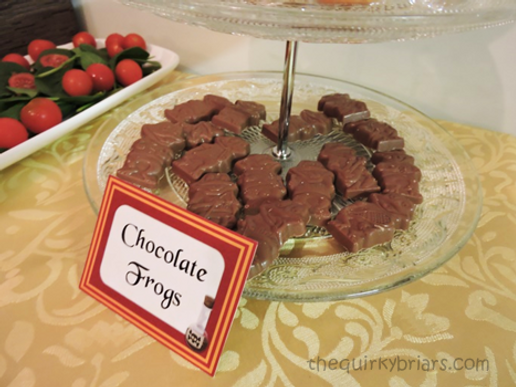 I am ever so glad Australia’s got Freddos – our very own chocolate frogs. Gave me the perfect excuse to take this lazy option, instead of having to search and shop for a frog mold and make chocolate frogs from scratch. 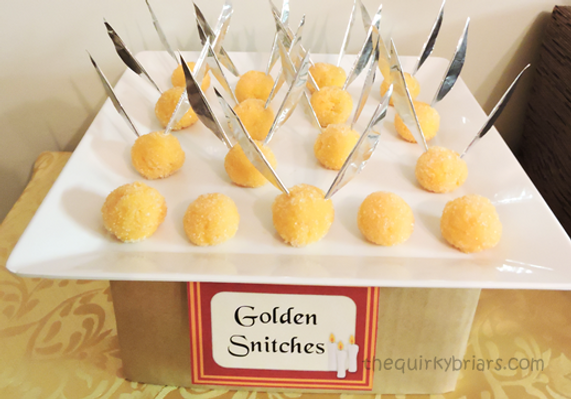 Finally, one of my most favourite HP-related item in the party – the golden snitches! They’re actually just egg yolks and condensed milk, cooked and shaped into balls. Days before the party, I spent one evening preparing all these snitches wings while watching Avengers on the telly. I love how they turned out, even though I was a few wings short in the end. Hahaha. But still, admit it, they are pretty and look like they’re ready to fly away. The guests were very amused with this dish, and they weren’t disappointed ‘coz the yellow balls were tasty too.